If you had to take a wild guess as to what a game called "Pinball Roulette" is like, the chances are that even the worst imaginations in the world wouldn’t be far off. Pinball Roulette is like your every day game of roulette with a pinball machine thrust in to it for good measure. It’s an obscure yet interesting combination, but it just about works. Pinball Roulette provides a nice change of pace from your standard roulette table, although I highly doubt I’m going to see it down my local casino any time soon. 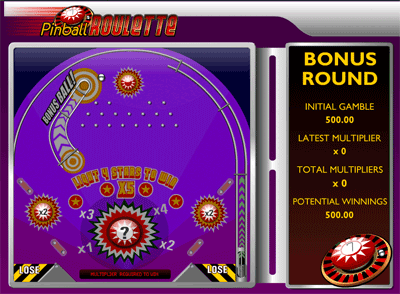 Pinball Roulette caters to a very specific type online games player. If you like your standard casino games as they are, then Pinball Roulette isn’t going to be your cup of tea. If you enjoy the more strictly arcade-like flash games that are totally different to casino games, Pinball Roulette is not going to float your boat. However, if you like a mish-mash of the two and enjoy playing variants of staple casino games, Pinball Roulette is going to be right up your alley. If you’re not quite sure about which type of player you are, you’re going to find Pinball Roulette "alright". It’s a fun game that makes up the numbers in an instant win games section, but it’s not quite a flagship game that will keep you coming back for more. How to play Pinball Roulette. Place your bets on the roulette table as normal. Set the pinball machine in motion and hope the ball falls in to a winning bucket. Choose whether or not to collect or gamble your winnings in a secondary pinball machine. The biggest difference between Pinball Roulette and standard roulette (aside from the obvious pinball stuff) is the option to gamble your winnings in a secondary pinball machine. The secondary machine is all luck, but it can provide you with much bigger wins if you can manage to hit a bunch of multipliers. When you first start playing Pinball Roulette you are faced with a standard European roulette betting table. 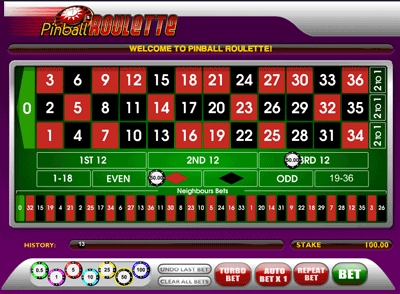 You can wager on all the same numbers, colours, sections and so on as you can on any other good roulette table. Note: As you’re probably already aware, the longer the odds of your wager on the roulette table, the bigger the payout will be. There are no differences here in Pinball Roulette. 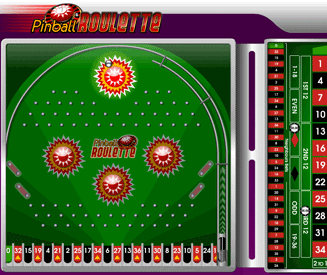 After you have placed your bets, a ball is released in to a basic pinball machine. The ball-bearing hits bumpers and trickles through the pins, eventually dropping in to one of the 33 numbered buckets scrolling across the bottom of the screen. This pinball machine is in place of the wheel in a standard roulette game. 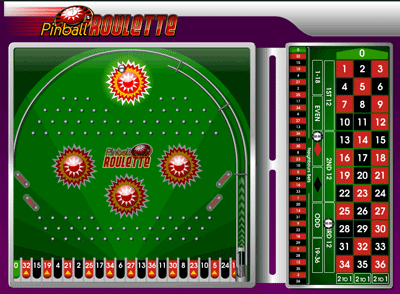 Just like in normal roulette, the ball is equally likely to fall in to any 1 of the 33 buckets (numbers). If you win money on the standard Pinball Roulette table, you are given the option to gamble your winnings on a secondary pinball machine. This second pinball machine is different to the first and contains bumpers with multipliers on them. The aim is to hit these bumpers and accumulate a big overall win-multiplier without having the ball fall in to the "lose" sections. Fact: The second pinball machine in Pinball Roulette is great fun, but it’s devilishly tricky to actually come away with a big win from it. You usually end up losing. Big central bumper. The multiplier increases every time you hit it. You can hit it up to 4 times, resulting in a maximum multiplier of 4x. Two side bumpers. These will give you a multiplier of 2x. However, only one hit counts for each (e.g. you can’t hit the same one twice for a total multiplier of 4x). 4 central lights. If the ball passes over and lights up the 4 circular starred lights in the centre of the machine, you will be rewarded with a 5x multiplier. All the multipliers in the Pinball Roulette secondary round are added together. Therefore, you can receive a maximum win-multiplier of 13x (5x + 4x + 2x + 2x).